How do you like your frosting? I like it sweet, light and fluffy and a little on the buttery side. 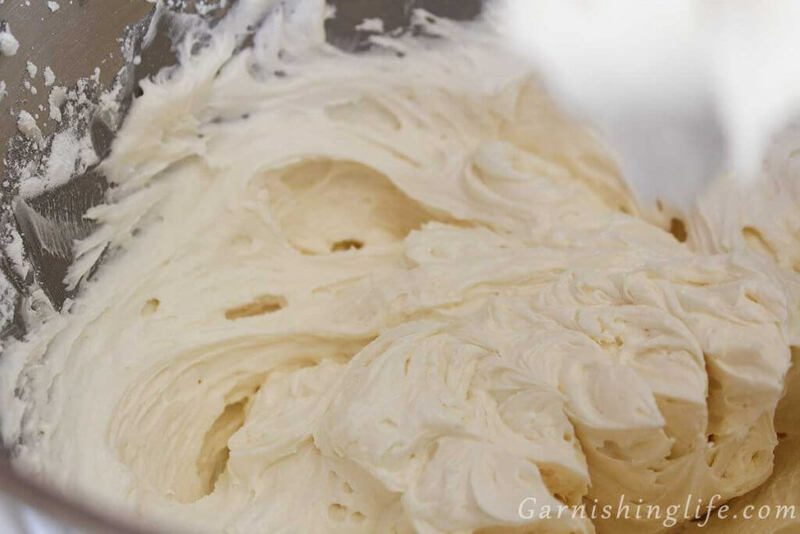 Here I will show you my Light Buttercream Frosting recipe. 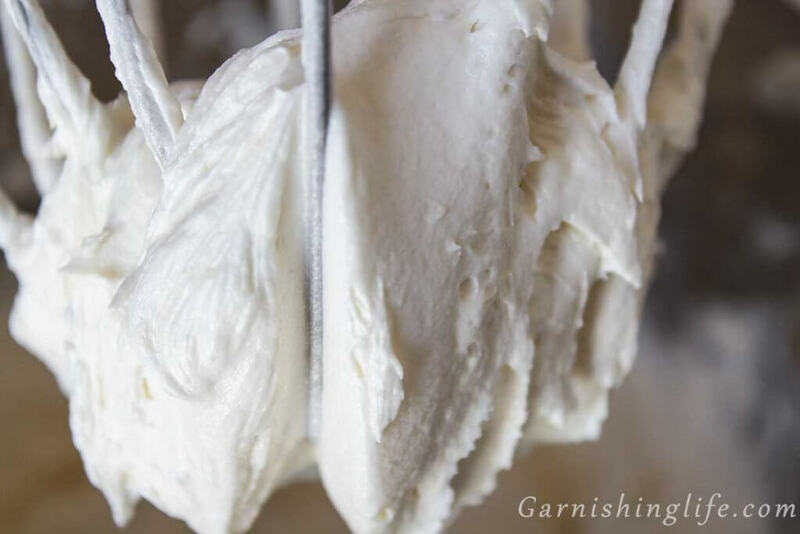 Light Buttercream Frosting is almost like a whipped cream, but with butter. Yums! My secret? I use a combination of butter and vegetable shortening and I whip it A LOT. Light Buttercream Frosting can be used as a base for an array of flavor possibilities, with just a few changes. I will introduce you to many other flavors in the future, but let’s start at the basics. To start, let’s talk mixers. I am biased towards my KitchenAid Stand Mixer, I absolutely love it. KitchenAid is not an affiliate, and we don’t make any money off recommending them. I honestly just want everyone to use one and know how great it is. 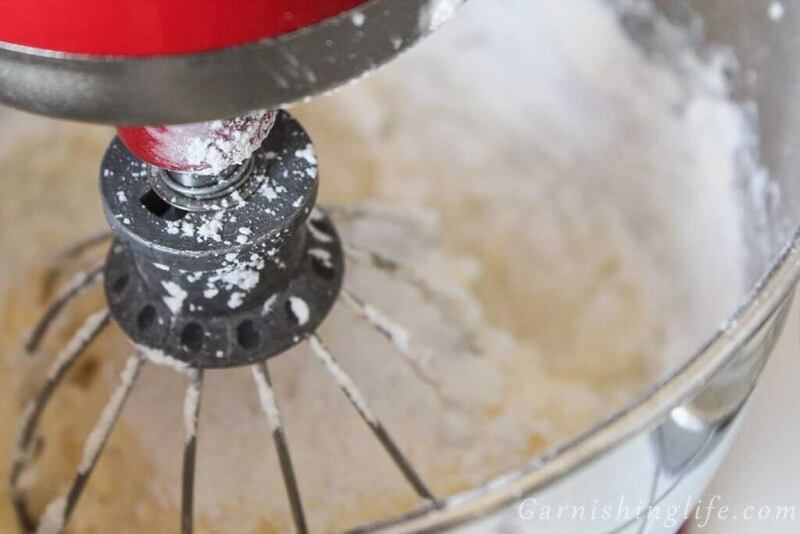 Seriously though, you’ll want to use a stand mixer. A hand mixer is going to be tiring because you mix for almost 20 minutes. 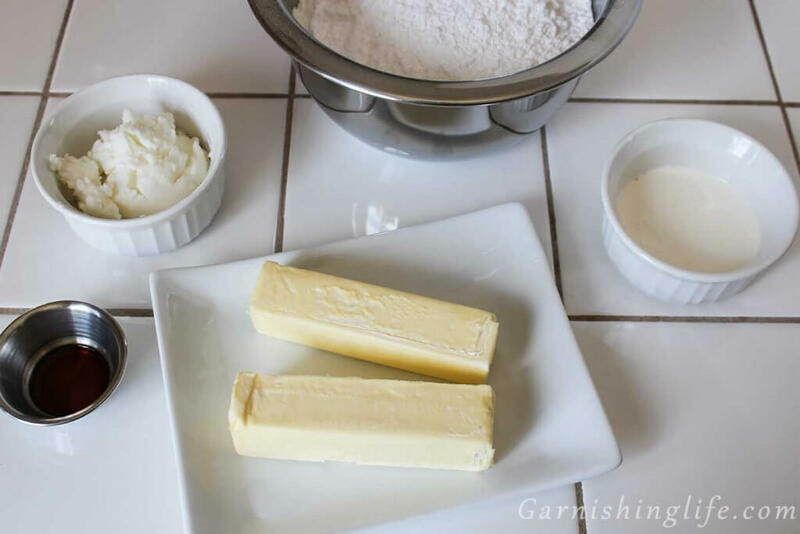 For the first round, you’ll whip together the butter and shortening on high for 8 minutes- using a whisk attachment. Scrape the sides of the bowl with a spatula when needed. Near the 8-minute mark, the butter mixture will become white and fluffy. There is an art to adding the powder sugar. 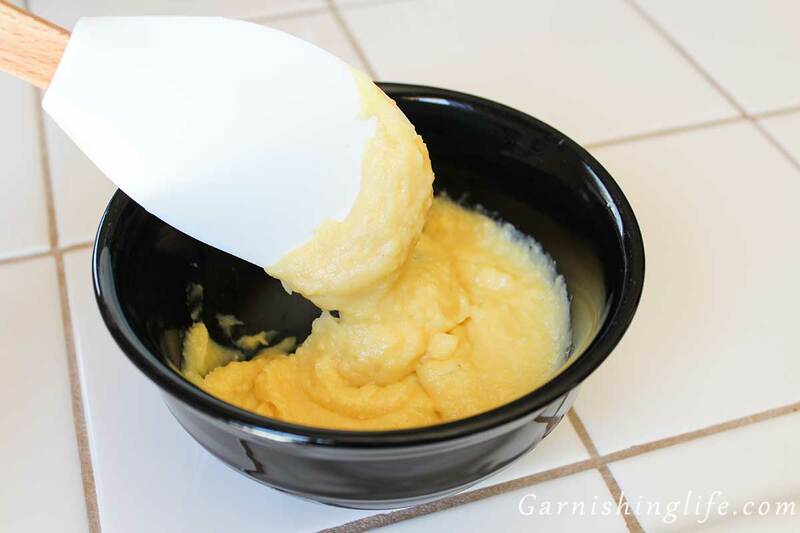 Spoon one ladle full at a time into the butter mixture and whip on low for 10-20 seconds. Scrape the sides of the bowl as needed. Repeat for remaining sugar. The butter-sugar mixture will be thick, so then you’ll whip in the heavy cream and vanilla extract. I will usually add the cream 1 TBS at a time and allow it to mix in for a few seconds before I add the next. And last, you’ll increase the mixer speed to medium and whip for 6 minutes. You’ll end up with a tasty frosting that is so creamy and light. I love it. It’s amazing on my Rich Vanilla Cake. 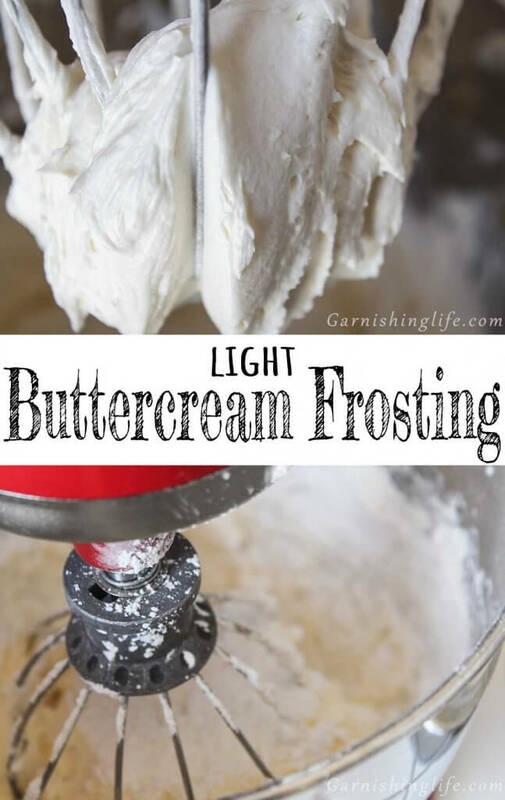 If you try my Light Buttercream Frosting, I’d love to hear what you think! 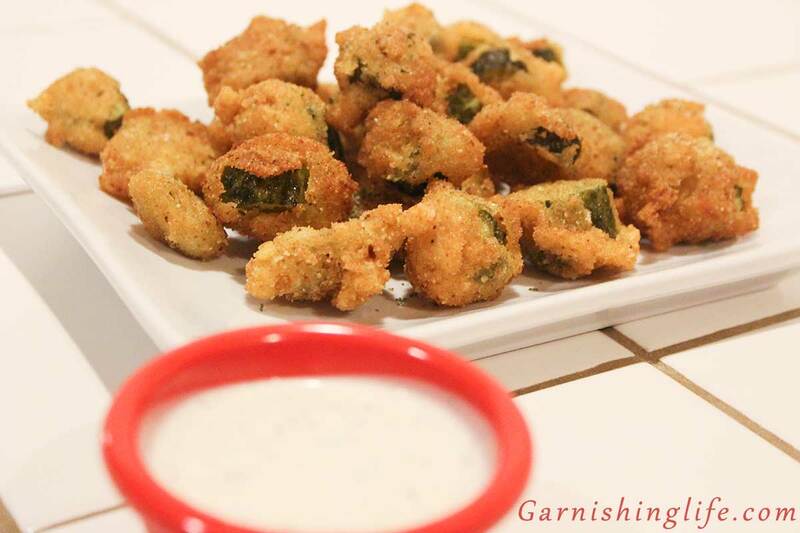 Please tag us on Facebook, Instagram or Twitter @Garnishinglife with the hashtag #garnishinglife. 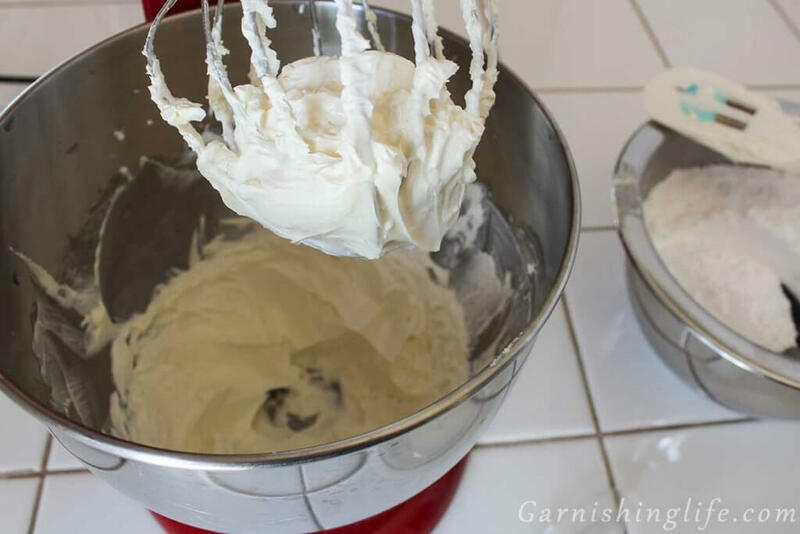 Using the whisk attachment on a standing mixer, whip the butter and shortening on high for 8 minutes, until white and fluffy. One ladle at a time, add powdered sugar while mixing on low. Mix for 10-20 seconds between each addition. Mix in cream and vanilla extract. Increase speed to medium and whip for 6 minutes. If you’re looking for a more classic buttercream, replace the ½ Cup of Shortening with more Sweet Cream Salted Butter. The result won’t be as light, but it will be very buttery and flavorful. I use the tub of Crisco All-Vegetable Shortening. They are not an affiliate, it’s just the only one I use. I have not tried a different brand so I can’t speak to the flavor. For a perfectly white color, use clear vanilla extract. I use the normal extract and that yields a fairly light, off-white color. If you do not use the frosting immediately, cover the bowl with a wet towel to keep it from drying and hardening. Whip for 10 seconds when you’re ready to use. For colored frosting, add the food coloring to the frosting when you add the vanilla extract. Try a few drops at a time and add more to darken. Always start with less color, you can keep adding color but you can’t take it back! Refrigerate extras in an airtight container for up to 1 week. Re-whip before use. Not sure what to use your extra bits of frosting for? Make a cookie sandwich between Nilla Wafers, or use it as a dip for graham crackers. Both are delicious!